Nnamdi Kanu, leader of the Indigenous Peoples of Biafra (IPOB), says he was granted conditional bail to be “caged” along with the secessionist group. Kanu, who is facing trial for alleged treason, was granted bail in April 2017 by a federal high court sitting in Abuja. He, however, jumped bail after flouting all the conditions given to him by the court, including a ban on public speaking. 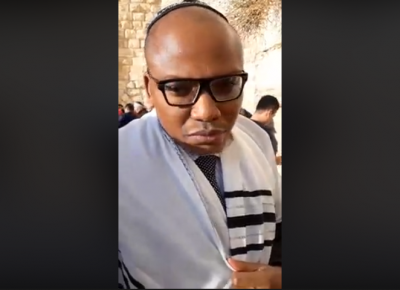 The IPOB leader subsequently went into hiding only to reappear in Israel about two weeks ago. Speaking during a broadcast on Radio Biafra, Kanu insisted that the solution to the Biafra agitation will be conducting a referendum. “Their problem is Nnamdi Kanu and the solution to their problem is referendum. They gave me conditional bail to cage me and IPOB but I refused,” he was quoted as saying in a statement by Emma Powerful, IPOB spokesman. Kanu said the Igbo have been voting for years, adding that “absolutely nothing” has come out of it. “It is either Biafra or we die trying to get Biafra,” he said. IPOB was banned and proscribed during a military raid in Umuahia, Abia state, which came on the heel of a dialogue between Kanu and south-east leaders. Kanu blamed the region’s leaders for the travails of IPOB. “It was Ohaneze Ndigbo and south-east governors that stopped federal government dialogue with IPOB. For that, the ban on Ohaneze Ndigbo stands still tomorrow,” Powerful quoted him as saying.